Most rock fans would agree that AC/DC guitarist Angus Young is one of the genre’s most energetic and entertaining performers. It’s impossible to imagine an AC/DC show without Young bobbing his head up and down in time to the music, playing amped up Chuck Berry licks on his Gibson SG guitar, shirtless and drenched in sweat. And in addition to his manic stage persona, he’s one of the best (and underrated) rock guitarists of all time. Born on March 31, 1955 in Glasgow, Scotland, Young and his family moved to Australia in the ’60s, just as the British Invasion was sweeping the rock & roll world. Young’s older brother, George, found fame as a member of the Easybeats, scoring a worldwide smash, “Friday on My Mind” in 1966. Inspired by their older brother’s success, Angus and another brother, Malcolm, began learning guitar and became fascinated by such bluesman as Muddy Waters, the aforementioned Berry, and such Brit-rockers as The Rolling Stones and The Who. The brothers formed their first band together in the early ’70s, taking the name AC/DC from their sister’s sewing machine. Young also stumbled across a gimmick that would remain his trademark to this day — band rehearsals were right after school, so he would practice in his “school boy uniform” (which consisted of a cap, tie, a white shirt, jacket, and shorts). The look became such a hit that Young wore the outfit on stage. He also began playing a Gibson SG, the only guitar model he would play throughout his career. Reportedly, his reckless stage presence came to be after Young had to cover up tripping over something on-stage, and the audience thought it was part of the show. The Young brothers turned a deaf ear to popular musical trends of the early ’70s (disco, prog rock, etc. ), and bashed out raw and simple three-chord rock, predating punk rock by a few years. And with the addition of singer Bon Scott, AC/DC became a sensation in their native Australia, soon signing a worldwide record deal with Atlantic Records. 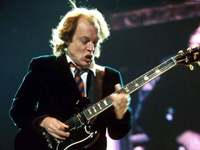 Check out Angus Young’s Fan Page! Rock on!